It’s a beautiful world—go, see, and enjoy it! There are a lot of wonderful people in the world—go and meet them! Hi, we are Diane and Dell Shiell. 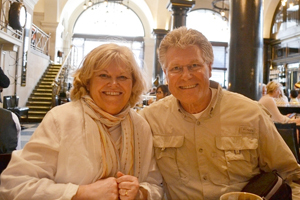 We co-founded Christian Home Exchange in 1992. We did our first home exchange in 1988. It was a life-changing experience for our family. At the time, our children were ages 10, 11, and 13. That’s the ages of our grandchildren, now! We are Christians, but you don’t have to do a home exchange with other Christians to have a successful home exchange. The “key” to your success is to take your faith with you—be a Christian wherever you go and with whomever you meet. We are an affiliate of the World’s #1 Home Exchange Network so we can provide you 65,000 home exchange listings in 150 countries. The thought of that many home exchange opportunities should get your imagination running free. We’ve written a couple of books to help you learn more about the home exchange experience. Give us your email so Amazon can send you a free copy of our book, Go, Pastor. Go! This offer is good for a limited time (to August 31, 2019). Our most recent book—Go, Pastor. 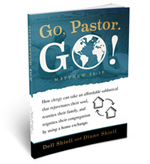 Go!—was specifically written to encourage clergy to use a home exchange to plan an affordable sabbatical. (Released December 2, 2016). Give us your email address and we will arrange for Amazon to send you a FREE COPY (Kindle) of this book—Go, Pastor. Go!—as our gift to you until August 31, 2019. You are, also, invited to visit our Blog where we’ve included articles about home exchanges and travel. Enjoy the adventure of a home exchange—for the time of your life!